When you see the extent of critical secrets China has stolen from us…you'll be shocked. But when you learn the details behind America's massive retaliation plan…you'll be thrilled. Here's how America plans to take down China's "Internet Army"
While some U.S. companies welcome the needed investment – seeing as the alternative in some cases is to close up shop – the U.S. government is still cautious about its new business ties with China. Not every deal gets approval. For example, in 2012, the Obama administration blocked China's Sany Group's investment in an Oregon wind farm citing proximity to restricted air space. Increased cyber espionage by China has also put a sharper focus on the increased acquisitions. After remaining silent for years, the U.S. government has become much more open about its convictions that China is actively stealing intellectual property. "The threat is not exaggerated," Dave Hess, president of Pratt & Whitney, a United Technologies Corp. (NYSE: UTX) unit, told Reuters. "It's a significant issue that we're all struggling with." But as many of you may have noticed, China keeps moving in. 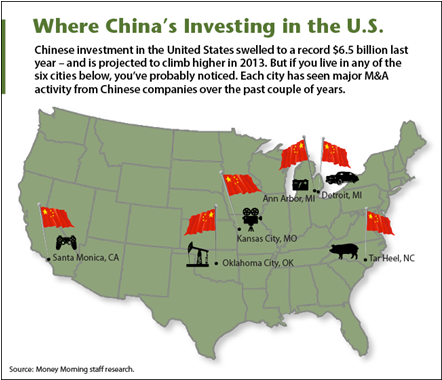 There are a number of U.S. cities where Chinese investment has increased drastically due to the available industries. Here's a list of six U.S. cities where Chinese investment has hit – or is nearing – billions of dollars. Hottest Spots for Chinese Investment in the U.S. The last Chinese investment in the U.S. was a $4.72 billion deal to buy Smithfield Foods Inc. (NYSE: SFD). Shuanghui International Holdings Ltd.'s bid for the Tar Heel, NC based pork company, founded in 1936, would be among the largest acquisitions of a U.S. company by China to-date if successful. Concerns have been raised about the deal due to numerous reports of Chinese companies skirting environmental regulations. In addition, critics maintain the deal could push family farmers and producers out of competitive markets. They want the deal carefully reviewed; some want it blocked. Sinopec Corp, China's second largest energy company, inked a deal early this year to buy a one-third stake in an oil and natural gas shale project owned by Oklahoma City, OK based Chesapeake Energy Corp (NYSE: CHK) for $2.2 billion. Early last year, Sinopec (also known as China Petrochemical Group), purchased a one-third stake in five oil projects in Oklahoma City based Devon Energy Group (NYSE: DVN). The Chinese energy giant invested $2.2 billion in 1.2 million acres in Devon's position in the Tuscaloosa marine shale in Alabama and Mississippi, the Niobrara in Colorado, the Mississippian, the Utica Shale in Ohio and the Michigan Basin. In 2012, multinational Chinese company Dalian Wanda Group completed the biggest purchase of a U.S. company by China when it bought AMC Entertainment Inc. for $2.6 billion. Founded in 1920 in Kansas City, MO by the Dubinsky Brothers, the takeover put some 5,034 North American screens in 346 multiplex location owned by AMC in China's hands. "The acquisition of AMC is just the start," Jianlin Wang, chairman of Dalian Wanda told CNBC last month, and "probably before the end of the year we complete one or two more deals." By the end of the decade, Wang expects to spend another $7 billion in the U.S.
A123 makes batteries for electric cars and grid storage, technologies China sees as a huge growth industry. So, in a deal cleared in 2013, Chinese company Wanxiang Group purchased the bankrupt lithium ion battery maker in a $256.5 million acquisition that left scores of lawmakers worried. Backed by U.S. tax dollars, A123 received a $249 million grant from the Recovery Act to construct advanced manufacturing plants in Michigan. Washington's policy makers are anxious not only about taxpayer dollars backing a company now owned by a Chinese company, but also about sensitive battery technology that could have military application being taken. One small highly specialized tech company is about to do something every American can get excited about: Crush China's attacks… while making unbelievable money for investors. In a push into America's auto industry, a plethora of Chinese companies are settling in the Motor City. A revival in U.S. automotive market has attracted a growing Chinese population and business network to Detroit. Membership in Detroit's Chinese Business Association counts over 100 Chinese owned businesses, most auto-related, in the region. "Chinese owned companies are investing in American business and new vehicle technology, selling everything from seat belts to shock absorbers in retail stores, and hiring experienced engineers and designers in an effort to soak up the talent and expertise of domestic automakers and their suppliers," Bill Vlasic wrote in The New York Times. Chinese Internet company Tencent took a majority stake in Santa Monica-based Riot Games worth roughly $400 million in early 2011. Best known for the blockbuster game League of Legends, Riot Games boasts the game has amassed 32.5 million players, 11.5 million who play monthly and 4.2 monthly who play daily. In March 2012, League of Legends became the No. 1 title in Korean PC Café. In Taiwan, estimates are 5% of the city's entire population plays the game. Forget the Headlines: Chinese Buying Big in the U.S.
Where's The Money: Chinese Investments in the U.S.
China's No. 1 Butcher Turns to U.S.
Capital should flow as freely as possible, and govt. needs to regulate without politics getting in the way. Maybe fresh money from abroad can help calm traders´ nerves a bit when we are taken off QE. Sound the fog horn, folks! Homeland Security isn't just about physically securing America. It should also protect itself financially from these Chinese grifters. I have no doubt that the Chinese will erode the workers wages, benefits and work conditions in addition to subverting the law and finding any method to lower costs and increase profits at the expense of customers, environment, and economy.